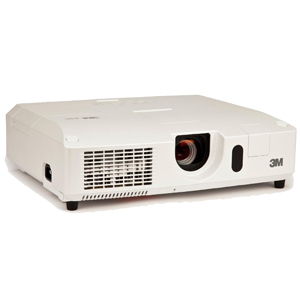 3M X56 Projector has a variety of I/O ports in order to cover for any business application. The HDMI port can support various image equipment which have digital interface to get clearer pictures on a screen. This projector has a 1.7 times optical zoom with horizontal and vertical manual lens shift enabling more flexible applications. Images from USB storage device may be viewed by plugging in the device and selecting the USB TYPE A port as the input. This projector can be controlled and monitored via LAN connection. Installed 16W speakers provide sound for large areas without needing external speakers.